Mix the flour and salt in a bowl. Add the eggs and oil, mix, knead for approx. 15 mins. to form a smooth dough. Shape the dough into a ball, then leave to rest for approx. 30 mins. at room temperature under a bowl rinsed in hot water. Divide the dough into thirds, roll out into thin strips (each approx. 13 cm wide). Cut the strips of dough into approx. 12 equal squares. Mix the bread and milk in a bowl and leave to absorb for approx. 15 mins. Add the mince and all the other ingredients up to and including the salt, mix. Beat the egg white. Place 3 tbsp of filling in the centre of each square. Brush the edges with egg white. 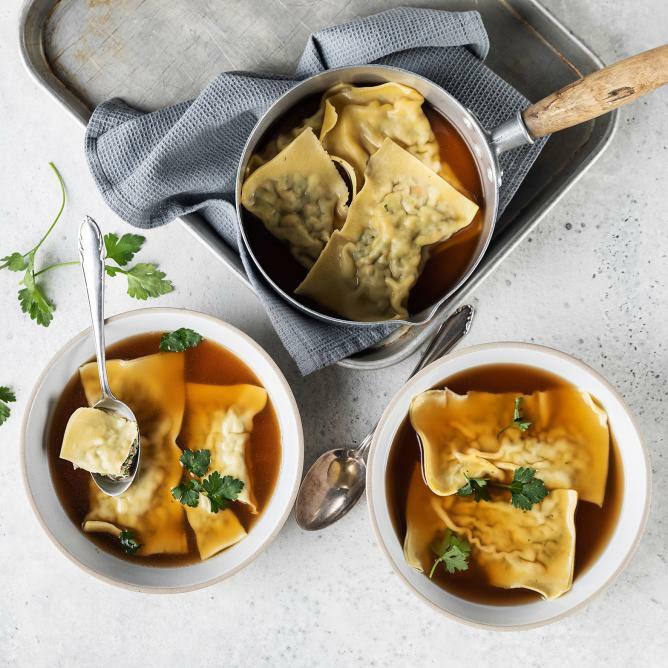 The ravioli can be kept warm in a greased baking dish at 60°C.